Discover the World's Best Pizza in the Western United States. Here's where you can eat the best pizza! 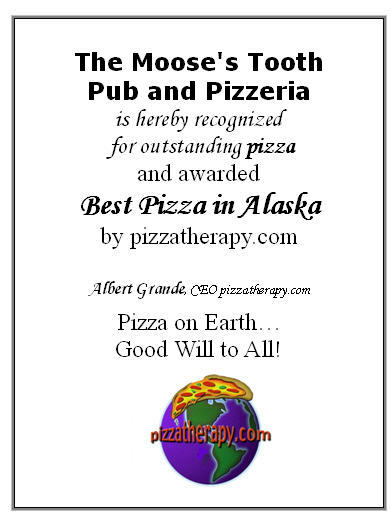 Alaska Anchorage The Moose's Tooth tgreale "This place is the undisputed best pizza in Alaska. Great sauces and crust, and the toppings range from traditional to some very creative non-traditional items, such as smoked salmon, Thai chicken, etc..."
Alaska Talkeetna Mountain High Pizza Pie bigfarb "This pizza is special for lots of reasons but mainly because the crust. Crisp outside, lite inside and the flavor, oooohhhhhhh mama! This guy is really making a great pie. I lived in lower Manhattan for twelve years and pizza is my food of choice. Arizona Flagstaff New Jersey Pizza Co. dougccox "An excellent re-creation of authentic pizza, baked to perfection on stone. I love green chilies on mine to give it a unique southwestern flavor (try getting THOSE in New Jersey!)." made by chef Anthony Redendo is top notch." from New Jersey. Everything is made fresh when you walk in the door... WOW!" are cooked in a wood fired oven." Arizona Glendale Pullano's Pizza Mpullwing "Pizza, service..............."
Apizza Heaven Anonymous "East Coast old style pizzas cooked on bricks. The best..."
Arizona Jerome Belgian Jennies jeromechief "Simply the best pizza we have ever had. From the crust, the cheese to the sauce and toppings. We can't get enough of it." 51 Great Pizza Parlors "...garden-fresh ingredients and gourmet toppings like smoked Gouda and herbed cream cheese, it's no wonder folks flock to this pizza joint in the middle of nowhere. Grab a slice..."
"THE BEST calzones on the planet, bar none." "This pizza is the best I have ever tasted....Everything, including the mozzarella and the spices, are home made and/or homegrown." Arizona Phoenix Nello's Duane "Hands down the freshest ingredients I have ever had." Arizona Phoenix Rays Pizza fmayer "...It's Great!!! Try the Sausage. I'm from New York and this is the real thing!!!" Arizona Phoenix Red Devil Pizza cindivwithani "Everything is good about the pizza, ...the sauce is fab, the crust is crusty and service is splendid!..." Arizona Phoenix Spinato's Pizzeria lrsmith "Spinato's pizza is very good. It is the best I have had. Their sauce is verydifferent and brings out the flavors of the meats. My favorite is the "Get Meaty"and my wife's is the "Mama Spinato's Signature Fresh Spinach". " Arizona Sedona A Pizza Heaven highestvibration "Wow. Best pizza in Arizona.....so far...thin delicious crust great sauce and cheese...its heavenly for sure." Arizona Scottsdale Chizona's branch2five "Chizona's is one my top 3 all-time greatest. 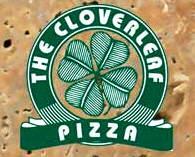 Nothing really to fancy but super fast & friendly service with one of the all-around freshest tasting thin crust pizza around. We always order enough to re-heat in the oven, it stay's great and get's only better." Arizona Scottsdale Grazie Pizzeria winebill "The complete deal - Authentic roman style pizza - great toppings and fantastic crust. This is paired with an amazing selection of Italian wines and outstanding service from Maurizio ..."
Arizona Scottsdale Romes Pizza dburns "These folks are native New Yorkers and their pies are great. Crust is crunchy/chewy, right amount of sauce, and oil pools on top when folded." Arizona Scottsdale Patsy Grimaldi's teach "They are the famous Brooklyn place...Opened 2-3 restaurants in AZ. ...Had the big ovens with the paddles, etc. I LOVED it... "
Arizona Tempe Greasy Tony's arroyoc "... the best pizza experience since I left the Bronx 6 years ago. One of the best pizza. They also make Sicilian pizza to that will rock your world." "He puts olive oil in the crust and the White Clam Pizza is out of this World...."
pizza melt in your mouth!" "I swear this is by far the best pizza since leaving New York. ... The sauce is great and the crust is to die for. You guys gotta try this stuff!" California Anaheim Luigi's D'Italia Richard Quis "New York Style Pizza - thin crust, olive oil and water mozzarella"
California Antioch Skipolini's Pizza cristinaher "The whole pizza in its entirerty. From the first bite until you are done you enjoy it..."
atmosphere. By the slice, or whole pies... try the pesto when your in town. Mostly take out"
94704-1613(510) 548-1129 Cole "This pizza place simply has a good combination of everything. Nice thick and doughy crust, perfect sauce, and perfect combination's of toppings! A place you must try if in Berkeley!" California Berkeley Zachary's Pizza Notlober "Amazing Chicago-style pizza! The crust in particular is superb..."
LauderdaleLegend "...Allegro will get you as close to East Coast Pizza as possible in this part of the country. They have a crust that is just above razor thin with a taste that is neither oily or yeasty. The mositure content is perfect and it is cooked to a golden brown perfection. The sauce is a slightly spiced version somewhat like having peeled tomatoes squeezed on the crust with a touch of high quality olive oil and a touch of oregano..."
but this is the best!" 3835 East Castro Valley Blvd. Albert Grande, The Pizza Promoter "Home of World Pizza Champion Tony Gemignani. Hand tossed pizza magic lives here. Tony also authored: pizza with Diane Morgan. " Listen to Tony G. on Legends of Pizza, Volume 2. Michael "The crust is perfect, with a great combination of crispy and chewy freshness. The sauce is zesty and the toppings are always fresh, sitting over a perfect bed of stretchy Mozzarella. I recommend the Cannatero's Special!!!" ordering the Prego Pizza ... when they are close to delivering. The 13-topping pie was concocted ... at the request of a pregnant woman who was two weeks past due. She gave birth that night..."
worked at Ray's) he makes an excellent pie perfect crust and great sauce." California Culver City Mama's on Motor Pete "Mama's on Motor just gets a blend I can't taste elsewhere. Maybe it's the red onions. Maybe it's the sauce. The classic crust. Words fail me - it just blends!" California Davis Woodstock's Pizza elephanttrainer "This place is awesome! Sauce inside the crust, dipped in blue cheese dressing, doesn't get any better." California Eagle Rock Casa Bianca janine "Classic thin crust, run-down-your-arm melted cheese, perfectly- spiced sauce." Coda "I'd never found a pizza I would call "World's Best" before I tasted the pizza from Marechiaros.... I've tried both their red and white sauce pizzas. Unbelievable. The red sauce is mild and slightly tangy but has a definite "Oomph" too it. Hard to describe. I call it "mmmMMMmmm" sauce. It's just plain good and it always seems to make me want another slice. The Canadian Bacon/Mushroom and Black Olives combination pizza is out of this world. Even their plain old cheese pizza is amazing. The size is good and they don't skimp on the toppings." Ingredients, Fantastic Service, Friendly Atmosphere & Fabulous Pizza. " California Eureka Big Louie's Pizza Co. Lear25 "...The best sauce and crust I have ever tasted. All recipes are from an old Italian family secret!" California Fort Bragg Piaci Roo "...My first bite told me I had rediscovered what makes pizza the Holy Grail. I will not compromise pizza and Piaci does not do so either. It is truly a taste from my past. The taste that myths are made of. My search was over. This is as good as pizza can get so far from Pizza Mecca of Wooster Street... "
California Huntington Beach La Rocco's Bradley "New York by the slice (whole pies can be ordered too). It's crisp but folds nicely and the sauce is spiced right. Note: Call before going, 'cause (as it states on the window) "they close when the dough is finished." "...ingredients come from local farms, mozzarella is hand-pulled in house, and you can get peppery arugula salad piled on any pizza. Plus, crusts are exceptionally flavorful. Mario Batali, no slouch in the pizza department, once declared Picco's the best pizza in the country.... "
Sunset Magazine "...Pie to try: The Cannondale, with homemade sausage and roasted red peppers..."
California Los Angeles Bottega Louie Jaime Bottega Louie serves a 15 inch Napolitano style pizza which is cooked in a custom built wood stone oven. All ingredients are handled with a lot of love and care. Their dough rests for 4 - 5 hours before it is used, also their sauce used for the pizza is cooked in the oven. California Los Angeles Mama's Original Pizza and Pasta Pete "...just gets a blend I can't taste elsewhere. Maybe it's the red onions. Maybe it's the sauce. The classic crust. Words fail me - it just blends!" That was 10 years ago. There have been some contenders, Albano's Brooklyn Pizzeria was very good, Mulberry pizza was not bad. However, Verrazano's Pizza has been the closest to real perfect NYC pizza I've tasted in Los Angeles hands down." California Lodi Ricks New York Style Pizza ddude "...the best pizza in the west coast. The crust is dusky, crisp, and tender in texture. The flavor is prodigious, an almost delicate fried, beer batter flavor. The sauce is exorbitant savory taste. The cheese is gummy and mild that surpasses the mozzarella standard...."
California Long Beach Nino's, Fred "very soft crust but very tasty, great sauce, great pizza.."
California Menlo Park Applewood funstrap "I tell all my friends that it is the best pizza in the world, but they don't believe me. Then we go there. Then they believe me. The sauce, the crust, the toppings, the greasiness--everything is perfect." Pizza slicers99 "The sauce, crust, toppings. Everything. I dream about this pizza. I miss this pizza." California Mountain View Amici's Pizza Mike "The closest to east coast pizza (Pepe's, Sally's, Bimonte's) as I can find on the west coast. California is not a great place to find good pizza, but Amici's is very good.."
California Mountain View Frankie, Johnnie & Luigi Too! kenfromnrca "...the pizza is the BEST! Everything about it is good! Stromboli....yumm!" California Newport Beach Z Pizza Richard Quis "Consistently great!" California North Hollywood Joe Peeps tribeca "...my fave local spot is Joe Peeps (must get the blue-collar pie) in NoHo. They have a good sauce...lotsa garlic..niceand thin..."
Chi Chi's debitini "The crust is thin but bubbly and the sauce has a hint of sweetness." "...this is ... the best deep dish pizza I've ever tasted." California Palo Alto & San Francisco Patxi's Chicago Pizza hacksnack "Light buttery crust and sweet sauce with lots of toppings. I've had pizza all over, and this one takes the pie." California Pasadena Greco's wslate "Great sauce with delicious chunks of tomato." California Port Hueneme Little Tony's scudqueen "Nothing "nouveau" about it - just good old-fashioned pizza." (Pizza Hall of Fame: CLOSED) Art Angelo "The thin crisp crust, not too much sauce and the toppings plentiful." California Rancho Santa Margarita Brother's West jcbgro "Brother's West is so special because the pizza taste truly gourmet...The ambiance is candlelight and cozy! " California Rancho Santa Margarita Selma's Chicago Pizzeria corymiller "Homemade deep dish pizza. Unbelievable flavor. You must try the "Works" pizza. It doesn't get any better." combinations of sauce and toppings to make a mosaic of extraordinary pizza." California Riverside Romano's Chicago Style Pizzeria calhighlander "The Crust! Try 'My Sister's Favorite', a four-cheese pizza. It's the best." California Redondo Beach (Pier) Zeppy's jennifer "The crust and the sauce are perfect and the best I've ever had. They always put the right amount of cheese and delicious toppings. When I did not have a car, I would often walk 6 miles to get this pizza....."
"...by far the best in the area maybe all of Northern California. John, the owner is a Brooklyn lad and makes a good Apizza...."
toppings, flavorful but *not* hot pizza sauce, plenty of good quality cheese. Plenty of parmesan and extra Italian spices on the table." California San Diego Bronx Pizza mark "The first taste as you put the slice in your mouth... lets you know that you have found it. Pizza nirvana. Every time a take a bite, I think to myself "this is the best thing in the world." The perfect amount of cheese, the wonderful, not-too-sweet sauce, the perfectly spicy pepperoni, plus the dash of garlic that I sprinkle on top... oh, I'm drooling just imagining it. Gotta go. It's almost lunchtime!" "Always a line out the door but worth the wait. The best pie in the city, no doubt." California San Diego Uptown Cafe Debi "This is the BEST PIZZA in San Diego ... and I have tried them all! Their sauce is amazing ...."
combination of sauce and not-so-thin crust that slide together made eating interesting..."
"...Pie to try: the blistered radiccho with chiles and pancetta..."
Palate Press "...Delfina’s immensely flavorful haute-gourmand pizza speaks for itself and one taste of the broccoli rabe pie (sampled five different times this year) will make you understand how fastidious and detailed this establishment is – all without ever batting an eye or allowing the visitor a moment of uncertainty..."
Sunset Magazine "...Pie to try: There's only one the oversize Margherita with mozzarella, basil and fresh tomato sauce... "
say the Paradise beats them all as the very very best!" Sunset Magazine "Pizzetta 211 has left people swooning.."Pie to try: That Margherita"
(415) 835-9888 Albert Grande, The Pizza Promoter "Located in the heart of San Francisco’s Little Italy, Tony brings his passion and perfection to North Beach, sharing his award winning pizzas with us all. Whether you choose the infamous Pizza Margherita or the savory Cal Italia, Tony’s will not disappoint"
415-861-3444 Albert Grande, The Pizza Promoter This is Anthony Mangieri's, new place in San Francisco. He formally owned Una Pizza Napoletana in New York. According to Anthony, Master Pizzioli: "I've been making this pizza since I'm fifteen years old, and you know, when all you do is one thing over and over again you tend to get pretty good at it." California San Jose Angelino's Dawn Gray "They have an old pipe organ...and the food is good, too!" The Pizza Promoter "Excellent pizza and very fresh ingredients". "The pizza here tastes fresh and is not too oily... The extra cheese and dried peppers are freely open for you to get at your whim, which is nice." California San Jose Renato's vnws "... thick crust with lots of toppings, especially cheese, .... The sauce is great too. The dough is like no other I've tried...."
California San Jose Round Table wendysprague "We really like the crust, the way it isn't too thick and has those nice air bubbles and is slightly chewy. The bottom is a little crisp and holds it's shape when you pick it up. They have a nice sauce too." California San Jose The Garret mgoof "The most incredible pizza. They manage to make a thick crust crispy on the bottom and perfectly tender on the top. The perfect pie!" the portobello mushroom and panchetta pizza with truffle oil. " slices always on hand . Best I've had in California." California Santa Cruz Pizza My Heart svarcados "The sauce, the crust, the quality and proportion make this pizza totally wonderful." California Santa Cruz Pleasure Pizza Anonymous "The best in the west! California Santa Maria Klondike Pizza dreadoctober "If variety is the spice of life, then this place has to be the spice rack! Great crust and a selection of sauces, all of which blend perfectly with their wide assortment of toppings..."
incredible toppings. All around the best pizza I've ever had." Caioti Pizza's: "goal is to provide the best in three worlds of pizza making. Caioti uses fresh herbs, artisanal cheeses, homemade sausages and sauces, hand selected vegetables and the finest local products available to craft our menu. We provide high-end food at reasonable prices." Discover Ed LaDou on: Legends of Pizza, Volume 2. California Terra Linda La Coco's Pizza mikanet "If You love Pizza you cant' miss out on this one..."
old. Since then, I've been to Italy, Chicago, New York, Phoenix, and Even Asia, ... as best I can remember, this Pizza was tops...Crust on the fresh deep side, lots of Motz...with appeal for kids...and as adults we try to recapture this...Napoli's was at Foothill Blvd. (Route 66 in Upland) and San Antonio, and they sponsored local baseball teams.Anyone else remember Napoli's; tasted a bit like Corina's? ...Big Italian community here." California Valencia Vincenzo's Pizza dea spam "They use sourdough bread/dough and the pizza ends up thick." California Venice Abbott's Pizza foodsnobs "Abbott's is one of the absolute best pizza joints in L.A. Try the 5 onion pie... makes my mouth water just thinking about it! " "... They have made consistently the best pizza ... They only use the finest fresh ingredients. Their sauce is what makes it superior. It is very flavorful and clings to the crust. " "...I will say, in my 35+ years in Colorado this is the best I've had! The toppings are flavorful and subtle. 12" round pies. I love a simple pie , and this one hits the spot! If your in Boulder and you are going to eat, this is the place! And reasonable!..." Colorado Broomfield Original Pizza Rick "For Colorado pizza this is the best crust, and the best pizza place I know." Colorado Colorado Springs Billy's Old World Pizza dougccox "Best in Colorado. A Chicago-style place, serving both outstanding thin and traditional stuffed pizzas..."
Colorado Denver Abo's heyrey.prod "The crust is that NY style. Thin yet chewy Sauce is not sweet with great garlicky overtones. Good mozzarella and toppings if you so desire. Slices on demand!..." Hawaii Small Business Internet Consultant "Good pizza in a bowling alley? You bet! This is a home made sour dough crust that is very tasty. I was pleasantly surprised. Also make sure you check out the local items on the menu. Outstanding!" Hawaii Aiea Boston's North End Pizza Bakery brenda "My family has enjoyed Boston's pizza for over 10 years now, and for good reason. These pizza pies have a super large crust with a mouth-watering flavor that we've never been able to find anywhere else (in Hawaii or the mainland), and they're loaded with yummy toppings..."
Hawaii Haleiwa Spaghettini Albert Grande, The Pizza Promoter "Good crust. Buy it by the slice on the North Shore." The Pizza Promoter ""At Big Island Pizza, we strive to give you the freshest and tastiest products available with a wide variety of selections at affordable prices. We use only the most wholesome and natural ingredients with no additives, preservatives, nor artificial coloring. Our dough and deli rolls are made fresh several times a day. " (Pizza Hall of Fame: CLOSED!) 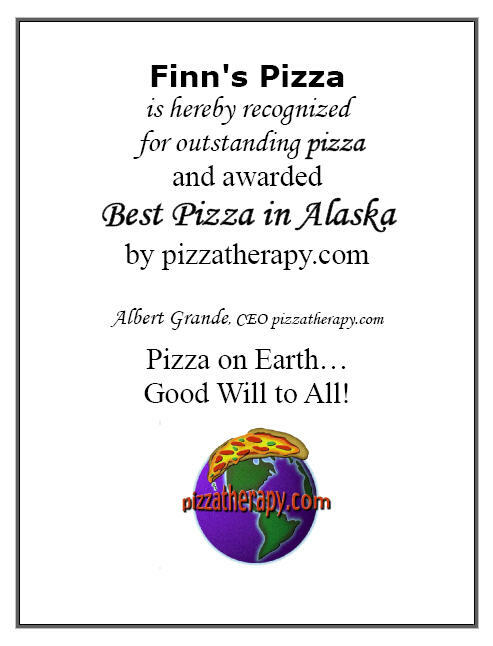 Albert Grande, The Pizza Promoter "Real New York style thin pizza in Hawaii! Superb crust with incredible taste! Excellent pizza with personality! A professional wrestler (J.T. Wolfen) and a Blues Man are the owners. (The truth is: they are both from Connecticut)." (Pizza Hall of Fame: CLOSED!) Albert Grande, The Pizza Promoter "Ultra-thin pizza in a quaint setting. Fresh ingredients married with good dough. (Honolulu Magazine) "...it’s great pizza, created by Tuscany-born chef Francesco Valentini." The "crusts are Roman—oblong, served on rectangular wooden paddles... "
(Honolulu Magazine) "...The Margherita...is reasonably classic, with shredded mozzarella instead of fresh, and large slices of tomato with a professional-looking basil chiffonade..."
Tasty Island Food Blog "Without s doubt, this is one of the true hidden gems in all of Hawaii. Inferno's is a portable pizza operation. Street food delivered with aloha! First, the pizza is simply outstanding. Excellent crust in a kiawe wood fired oven. Without a doubt The Best Pizza in Hawaii. The pizzaiolo Kyle and co-owner John ooze pure passion for pizza. They want to take care of their customers. Believe me, if you love pizza, consider your self taken care of! And with the price a pizza, you cannot go wrong! Kyle and John have pizza passion. The crust was incredible. A superb Neapolitan pie right in Kalihi! My prediction, is Inferno's will open a sit down restaurant within a year..."
"Real New York style pizza, in Downtown Honolulu. Excellent." (Honolulu Magazine) "...you get a 12-inch, hand-tossed pie, crispy, even scorched around the edges for extra flavor,... There’s plenty of bubbly brown cheese and fresh basil, but the revelation here is the tomato sauce, which was so good I wandered into the kitchen... "
(Honolulu Magazine) "...Chef Alfredo Lee sent to all the tables in the dining room a slice of his Pizza Margherita, perfect crust, lively with fresh tomato and a knot of fresh basil..."
"I was completely blown away by the crust. This is real pizza cooked in a kiawe wood fired oven." (Big Island) Kona Kailua Kona Brewing Company dave "...Sit outside under the tiki torches and palm covered tables, enjoy a pale ale and a great gourmet pizza. Kona Brewing Company has great pizza!" Hawaii Kailua Peppino's Pizza Ohiawood "They make their own: 1.) Sauce 2.) Dough 3.) Sausage!!! Good balance between the layer of crust & sauce (crunchy on bottom & chewy on surface)." The Pizza Therapy Pizza Book "Some of the best pizza in the Tri-State Area (you name the states). A thin crust Napolitano pizza, fresh ingredients, made with love and passion. Everyone who tastes it becomes a convert of Pizza Therapy. " "The food is OUTSTANDING, ... the atmosphere, the employees, and the level of attention to excellence is out of this world. There is no other place like this, period." / "Everything! Everything makes this place special. Crust is to die for!! Dough made fresh daily, loaded toppings, located in a beer and wine store, the place has 36 doors of beer ice cold, omg its to die for! I am in heaven at this place, you got to see it,!!!" "Buddy's has been around since the 60's and they produce the pizza I grew up with...a crust with little lift, a great sauce and the combo with anchovies is the best! Thanks Julie, Steve and Christie." "...check out Gallicano’s pizza. By far some of the best pizza ever. Owner is from NY and a long line of Italian family foodie"
here and had the ovens shipped from NY crust so thin you can eat a whole pie:). " Gardiner K Bar Bapper "The best pizza I've ever had out of this state was at the K-Bar. Thincrust, well cooked and great toppings. Bunch of fireman were there one night when the alarms went off and they all left their pizza. They hesitated, I hawked, but in the end they came back and finished it up. North end of Yellowstone, try it!!!" jws3 "The crust is so thin, you need to fold it to eat it. They cut the pizza in little squares (to be different? make it easier to eat? who knows....who cares?). The sauce is not too sweet and a little garlicky - best pizza ever -nothing can come close!!!" "I've had pizza in many large cities, including many listed on this website as being the best. But Howard's makes by far the best pizza I've ever had..."
week and hooked our family on the tradition..."
Montana Plentywood Fergie's Pizza carol mc5 "What makes this pizza establishment so great is that it is owned and operated by Fergie (Tom Ferguson) himself with the help of his wife Barb....the delicious assortment of pizza will always fill your stomach..."
Nevada Las Vegas Gallo's Pizza Kitchen K "The all around pizza is outstanding. Sauce is zesty and the crust is great! They put Garlic Butter and Parm on it!!" 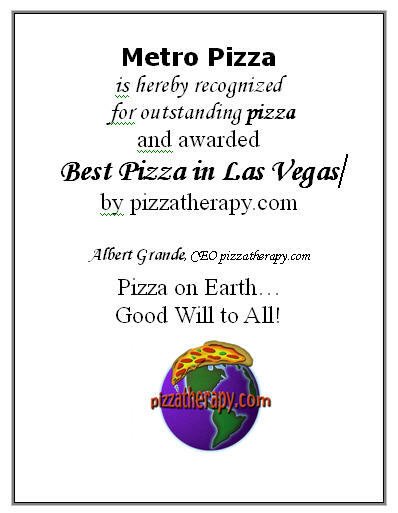 Nevada Las Vegas Metro Pizza Angie "They have the best pizza I've ever tasted. They have the best ranch dressing aswell. The staff is friendly. They cater to families with young children. The food isalways perfect and consistent." "Voted Best in Pizza Las Vegas"
"Here's the deal about Metro: not only do they have great pizza, but these guys are devoted to pizza. John Arena and his cousin his cousin, Sam Facchini have created a pizza community. Their pizza is the Best in Las Vegas, hands down. John Arena is the Professor of Pizza. You can listen to an incredible interview with John, at his page at Legends of Pizza." View the Metro Award here. Nevada Reno/Sparks Big Apple Pizza morghockey "The owner is from New York and New Jersey. He makes the best Best Italian pizza in the area. If you're ever there, it is a must try." oven users. The owner is from New York, and her place is like a NYC joint: red vinyl booths, fresh dough, quality sauce and huge slices..."
Saggio's nmbullrdr "Simply the best pizza. The sauce is perfect. The crust is chewy on the outside and tender on the inside." cheese special, but the more adventurous eaters will devour the Shrimp Etoufee pizza, or my husband's favorite, the vegetable stromboli." Crossroads Pizza meccinder "This place has the best crust and delicious toppings. The owner is so friendly and can cook other great Italian foods..."
North Dakota Valley City Dave's Pizza neonneon "No joke, this place serves the best pizza in the Midwest! Obscure location, but FANTASTIC pizza. Thin crust is crispy, but with just a hint of chewy-ness. A little bit of zing in their original sauce makes for a wonderful 'za. " Oregon Bend Little Pizza Paradise Big D "Pizza as good as the best East coast places!! Great crust & sauce and out of this world cheese. One of the best places on the West coast without a doubt." crispy it's flaky and tender." Ambrosia Doc Pepper "All hand made pizza. Baked in a wood fired oven. Awesome!" Papa's Pizza gmn "The best crust ever!!!!!" and use only fresh ingredients." Oregon Leaburg Ike's Lakeside Pizza Angie "The drive is beautiful, and not so far out of Springfield. It's got a great atmosphere, and is always delicious..."
Abby's Pizza abdelloyd "...Every one I know has had the best pizza experience with..." this "restaurant.... I am still trying to make my pizza the same as they do..."
(Legends of Pizza, Volume 1) "...they are just going bonkers there, I don't think Portland has ever seen pizza of this caliber...Brian Spangler is the pizza maker...I had one of his pizzas and the first words out of my mouth were "It's as good as Bianco's!" I had never said that about any other pizza I tasted". have been lucky enough to enjoy it around the world and Bellagio's Pizza is by far the finest pizza I have ever tasted. The crust is perfect, the toppings are fresh and bursting with flavor. It is truly the best pizza this planet has to offer." Oregon Portland Blind Onion Pizza Warren "...the pizza is great, good micro-beer specials its a a very unique small room with good music,..."
Flying Pie Pizza gator "Just plain good!!!!" The Pizza Promoter "The pizza at Ken’s Artisan Pizza is inspired by pizzas Ken and chef Alan Maniscalco each have enjoyed during visits to Italy and elsewhere in Europe. Baked in the intense heat of a wood-fired oven, with a blistered crust, and topped with the best ingredients they can find, pizzas are baked in about 2 minutes time." (503) 645-8225 Bob "One of the best pizzas I have ever had, seems expensive when you read the menu, but you have to see the PORTIONS...If you get the large Colossal, (everything) you might grunt to pick it up. Loaded with toppings, one large will feed my family of three at least 3 meals. And its great." (503) 234-0330 Jon F. "Mark is the guy. A gentle giant...He made his mark doing wood fired bagels and now he has moved over to making incredible pizza....The crust was very tender and light...very hard to describe...but tender and light is how it tasted..."
The menu of Tastebud looks amazing. They even have an all the pizza you can eat on Sunday nights. From their website: "Mark Doxtader is the chef/owner who has a passion for the rustic alternative to traditional catering. He believes in creating a community of members who are interested in sharing meals." Also includes Montreal Style Bagels to go. Book me a flight to Portland. I'm on my way! Geppetto's sstadeli / jj_isaacson "The people, the pizza and the drinks!! :)" / "Killer crust, tasty sauce, imaginative (as well as traditional) toppings..."
up. The sauce is just the right sweet and tangy." (605) 256-4986 Brett "...My dad and my aunts used to bring to this great pizza place called Skippers pizza and to this day I believe it is the best pizza I have ever tried and believe me I have ate at a lot of pizza joints around the upper Midwest and some in the south. But yes pepperoni and shrimp has always been my fav..."
Charlie's Pizza Anonymous "Great flavorful cheese. Tangy sauce. Chewy crust. This pizza will satisfy your need..."
Conan's debrupp "Conan's deep dish, whole wheat crust is fabulous! Plus, their ingredients are sublime: fresh, great cheese - mmmm." Texas Austin Home Slice Pizza George "Their pizza tastes just like home, Brooklyn NY. If you live in Austin and want NY pizza then you must go here." Don Vito's samueldecarlo "Pizza Chef, "Don Vito", creates in his country kitchen a hand-tossed, brick-oven pie with a golden crust and spicy sauce to die for! His recipes were brought over from Sicily by his grandfather!" Panjo's noblwish "Their deep dish pizza is to DIE for! Certainly the best pizza in CC..."
Brother's Pizza thelfox "They make dough every morning from scratch. Their sauce is superb!! ...can't imagine ever eating pizza out anywhere else, except my own kitchen!!" "Great crust, great sauce, great everything. The salami pizza is my favorite..."
anchovy, lightly burned edges and fantastic spicing. Best in Dallas." Texas Dallas Primo Brothers Pizza mirlinvr "This pizza is special because it really has the perfect combination of sauce, cheese and crust...When I take a bite the aroma first engulfs me and then the taste is beautiful...It really is the best pizza I have ever had... "
"Its truly a unique place. All made with two day rise in the yeast, all natural dough, and every pie is hand stretched and fired in our only wood oven." A Mediterranean infused menu is featured serving handcrafted pizzas, entrees and other mouthwatering bites out of wood burning ovens. We offer a menu highlighting flavors from afar, whilst utilizing local farm fresh ingredients. Big Curlz Curley Family "...It is hard to find a good pan pizza in Texas, this place does it for me!" Star Pizza Windy "This is the best pizza I've found and have been going there for over 20 years. My favorite is Joe's Pizza - whole wheat or white - with spinach and garlic." Collina's Italian Cafe Stephen "...It is euphoria on earth..."
Vessuvio's jon davies "The crust is thin and perfect. Provel Cheese (not Provolone, from St Louis) is fantastic. Ingredients are excellent. Great taste. No oily mess. 10 out of 10 !" Texas McKinney Jim's Pizza Michael "Jim's has the absolute BEST combination pizza in the world. The crust, the sauceand the toppings all merge into a truly delightful experience." Port "A" Pizzeria Betty "The Pizza, the sauce, the crust, the service, atmosphere, cleanliness." great, the place is clean, and you can't go wrong with their prices. ..."
Texas Port Aransas Mama's Pizzeria swing "....They use real pizza ovens and have a thin, NY style crust. You can watch them hand toss the dough while you listen to the friendly staff ramble about lif on the Island. Their sauce is light and they use the real whole milk mozzarella..."
Pizza Inn pkhara "The Pizza here is soooo good! Try this and you will be hooked!" 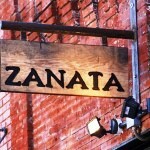 " it has been consistently my favorite place to eat. The first time I had their pizza, the cheese was so rich and the sauce so agreeable that I thought I was in heaven. I heartily recommend this Italian Restaurant for anyone who'd like to take a friend, family, or grab a quick bite for themselves. 4 out of 4 stars." Romano's nononame "The best pizza we have ever had. The sauce is to die for and the crust is perfect." Texas San Antonio Big Lou's Pizza jmf "This place is the best all the toppings are fresh and the sauce is awesome...On the weekends the lines are out the door. Big Lou's has been recognized in USA Today. The staff is realfriendly. Big Lou's is great...You have to try it." Colonna's Pizza & Ristorante Michael "Their Pizzas are the bomb. It's a family recipe for the dough they use." Florio's rvmoody "...The pizza is a generous size with excellent sauce, crust and toppings...make sure to stop by Florio's, you won't be sorry..."
Grant St. Pizza randy "This is everything good pizza should be...The crust is ultra-thin, the sauce has a very fresh, flavorful blend without a lot of superfluous spice. Bottom line, fresh, fresh, fresh!!!" Texas The Woodlands Greek Tony's Pizza & Subs primodus "This is the best pizza in the world, bar none! Crust, sauce, cheese, the works! The Pie Slama Jama is their masterpiece 16", 7lb. pizza. AWESOME!" Utah Layton Gabbo Brothers Jim "Absolutely awesome pizza in a little old restaurant. The calzones are...good too"
"It is a Pizza icon and one of the best ever." Utah Salt Lake City Big Apple Pizza Jim "New York pizza in the west." Pizza Bear jonnbray "Pizza Bear makes the best thin crust pizza I have ever had! They give you ample toppings, and their Margherita pizza is the very best. This is one of Bellevue's best kept secrets..."
Washington Burien The Pizza Gallery charleslafferty "...The Pizza Gallery has a diverse menu, great portioning and great quality overall....Great for a non-pizza town"
Hubby's Pizza oingalls "Everything about their pizza is great...great crust, great sauce, loaded with toppings... great atmosphere.."
Coyote Creek laura "Amazing crust - really incredible. Also they make everything themselves -- sauces, dressings, you name it!...You have to try them!" (Pizza Hall of Fame: CLOSED!) Hillspet "It was a unique thin crust pizza that I liked and haven't found anything close to it across the US." Perry's Pizza soniawise "The dough, its the Pizza!" Alfy's Pizza caleb "Pizza is always full of toppings and crust is so good that you want to eat it too, instead of throwing it away..."
chunks of tomato and sauce on the top. VERY tasty." Luigi's Italian Restaurant and Pizzeria fjc "The best New York style pizza in the west. All the toppings are fresh and they pile them on like nothing I've ever seen. They spare no expense in making an unbelievable product. Well worth the money." combination of crunchy and chewy. They also make their own sauce, which has amazing herbs and spices in it that are to die for. As for the other toppings, Waterfront has every combination of toppings you could ever dream of ready to sell by the slice, whether you like veggies or meat or just a slice of cheese, you can go in and enjoy whatever type of pizza you crave the most. Another wonderful aspect of their pizza, is that they are generous with the ingredients, there's a thick and wonderful crust, the perfect amount of sauce and a wondrous amount of cheese (and other toppings if you want ... "
Cafe Lago btrathen "What sets them apart is that it is a total package, the crust is thin and crisp, the sauce is vibrant and fresh, the service great, and the owners are hands on. They also bake in a wood fired oven." Delfino's Tacomaboy "Makes a Chicago boy feel at home. The deep dish pizza has a flaky crust and great taste." Northlake Tavern dnynamzug "Thick slice ingredients! Two large pieces is enough for most. Fantastic flavors..."
Pegasus on Alki unkown "...fresh spinach, the thin matchsticks of pepperoni on top so they're crispy, and those sunflower seeds--creative and extremely tasty." "...The crust was ultra thin and the sauce. . .oh the sauce! It was a tad sweet, but a tad hot, and the cheeses were not glommy or overkill. I loved the place so much I took a job there, and threw pies for a summer..."
Yelp "Piecora's is the BEST PIZZA IN SEATTLE. I often bus to it from Northgate because I crave it to bad. And it's very reasonably priced, too. A slice, some garlic bread, and a gin & tonic and I'm ready to crawl the hill!" "The crust is light as a feather and quickly attains a fluffy crispness in no time. Hand shaped, of course, and beautifully burned..."
compare. Vladimir is the owner of the establishment and has been the head cook forover 20 years. He makes the most melt in your mouth crust and uses all natural ingredients; plus he grates his own Mozzarella cheese..."
possibly the best pizza I've ever had." "...the crust is the secret to the pizza. We order the medium and put the our toppings, when the pizza arrives, it’s to die for. We often will have them make an extra 10 or more, they cook and wrap, and we will freeze them and take them back to Phoenix to experience it all over again. The crust is somewhat chewy, not soggy, and light yellow coloring. " like Italy with more toppings, like Chicago with more pride. The perfect Taste!" Mountain High Pizza Pie bwholey "... The crust is pleasantly chewy and the toppings are fresh and rich. Believe me, I know what I'm talking about when it comes to pizza; I'm from Connecticut and was raised on Sally's and Pepe's. Mountain High is definitely in their league. It's heavenly." from pizzatherapy.com. Read the Review by Jon F.
Vote for "Best Pizza in the World!"